Faneuil Hall . . . the name conjures John Adams, Daniel Webster, Wendell Phillips, Oliver Wendell Holmes, and now, Giacomo Puccini? Perhaps that last individual found himself in unlikely company. 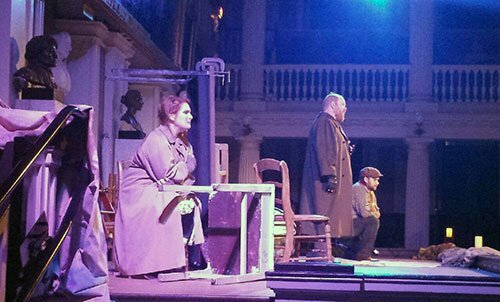 Which is what made the success of the North End Music & Performing Arts Center (NEMPAC) Opera Project’s production of La Bohème, presented in the Boston landmark’s Great Hall this past weekend, so peculiarly gratifying. Faneuil Hall may not be the first—or the 50th—place one might expect to find quality 19th-century Italian verismo opera, however NEMPAC’s cast, orchestra and production team proved that the limitations imposed by an unlikely venue could not stop dedicated and talented artists from producing compelling work. The hall’s acoustically imperfect structure challenged the musical and theatrical logistics; still, the production team, apparently seized by the same dogged spirit that fueled Puccini’s bohemians and the earlier patriots, made something of the space, with emotionally and intellectually satisfying results. Tiffany Chang (Music Director) and Samuel Kjellberg (Assistant Conductor) joyfully expounded on the 119-year-old work’s aesthetic pleasures and widespread appeal in their program note, while Stage Director Adrienne Boris spoke to the opera’s treatment of the challenges inherent to living a life of artistic integrity in an often-hostile society. The production team’s sympathy with the characters in the opera, based on Henri Murger’s 1851 novel Scènes de la vie de bohème, was palpable throughout the evening. A story of starving artists living and dying in penury and squalor runs the automatic risk of becoming flatly maudlin; thankfully, however, under the capable direction of the NEMPAC artists, the performance was suffused with great warmth, humanity and vitality. The directors’ enthusiasm for the property clearly carried over to their players; the Saturday night cast proved more than equal to the task of bringing the opera to exuberant life. Scott Ballantine livened the scene as the composer Schaunard while Seth Grondin as Colline poured his rich, velvety bass-baritone into “Vecchia zimarra,” the philosopher’s Act IV ode to the coat he is about to pawn to ensure his dying friend’s comfort. Grondin’s delivery of the aria was gorgeous in timbre, though his diction might have been a bit clearer. Miles Rind was a comic standout in the minor role of the landlord Benoit. The vocal ensembles sang with remarkable unity and power, and the children’s chorus in Act II (featuring students from NEMPAC’s music education program) was perfectly charming. The four principals provided a solid, diverse quartet around which to base the action. Soprano Lindsay Conrad is a natural comedienne whose “Quando m’en vo” was a bright-toned exercise in gleeful misbehavior; her Musetta was an appealingly shameless vamp, whose motives in the Café Momus scene were as transparent as her antics were effective. She was therefore an appropriate romantic foil for baritone John Allen Nelson, an overtly masculine presence as Marcello. His robust portrayal produced an unusually potent comedic moment in the final act when, as Marcello satirizing female modesty, Nelson’s momentary switch to a tinny falsetto was rendered all the more humorous by contrast to his otherwise hearty sound. As diametrically opposed archetypes of male and female sexuality, Nelson and Conrad had electrically charged interactions as the on-again, off-again lovers; indeed, at the close of Act III, Marcello and Musetta’s exchange of insults was so vigorous that it seemed to carry with it an implicit threat of physical violence. Nelson’s and Conrad’s portrayal of a decidedly earthy romance allowed for the gentler, more spiritual quality of the love between Mimì and Rodolfo to stand out even more clearly by contrast. As Mimì, soprano Jessica Jacobs gave the production its soul. Her sensitive portrayal of Puccini’s soave fanciulla was utterly guileless and charming in its simplicity, her acting honest and affecting. Moreover, Jacobs’s voice, though not particularly Italianate, was beautifully suited to the repertoire; her portamenti were seamlessly executed, and her crescendi were, at times, thrilling. A certain otherworldly quality to Jacobs’s sound made the final scene of the opera all the more haunting, as Mimì takes leave of this life and her loved ones. Moreover, Jacobs’s ability to respond organically to her cast mates puts her in a growing minority of opera singers who are able to fully integrate dramatic truthfulness with fine vocal delivery; it was refreshing for this reviewer to see so well rounded an operatic. Jacobs brought out the best in her costar, tenor Ethan Bremner, whose Rodolfo was powerfully sung though somewhat lacking in nuance. That said, his duets with Jacobs were imbued with great tenderness; their paean to love at the close of Act I was galvanizing in its emotive power. For as successful as the singers were, the 40-piece orchestra, under Chang’s deft baton, threatened to steal the show. The ensemble played with impressive unity, focus, exceptional clarity and finesse. True, there was little in the way of the emotional extravagance one typically associates with a Puccini orchestra, but what was lacking in histrionics was more than made up for in a compelling, judicious interplay between restraint and passion that propelled the action with remarkable efficacy. Each section had occasion to shine; notable moments included the woodwinds’ sweet embellishment of the heroine’s self-description in “Mi chiamano Mimì”, while the brass and percussion swelled forcefully in the opera’s hair-raising closing bars, overwhelming the audience with the hero’s grief. As for the staging, Boris approached the challenge of mounting a full-scale production in Faneuil Hall by embracing the space on its own merits. The results proved mostly effective, though in many ways problematic. Her concept places the action in an imagined near future; she writes in her program note that the design team “began to conceptualize the hall as a once beloved national treasure, now without conservation funding, in which the artists are essentially squatting.” A resourceful concept, to be sure, but one that poses a few minor problems of logic—how is it, for example, that a group of squatters should have a landlord demanding rent? Moreover, the concept required a certain amount of fluidity in the audience’s understanding of the space as is versus as a neutral stand-in for various alternate locations; scene changes were indicated in large part by the rearrangement of props between acts. Boris addressed the issue in the program note, remarking that “the Hall’s many playing spaces do not make up a literal ‘set’ for the action, but rather provide a flexible canvas on which to conjure the many stories told in this timeless piece.” Fair enough, and understandable given the restrictions posed by mounting an opera in a registered historical landmark. Theona White’s costumes, designed with the apparent intention of mimicking the kinds of garments that starving artists living in a dystopian near-future might scavenge and wear year-round, were appropriately unglamorous for the setting, with the exception of the holiday outfits worn by Musetta, her protector Alcindoro and the ensemble in Act II. The majority of the action took place on the Great Hall’s small, shallow raised stage, set at back of the auditorium. The orchestra was placed on the floor just in front of the apron, level with the audience. Given the restricted formal playing area, and with a stated desire to make full use of the Hall, Boris liberally distributed the ensemble throughout the auditorium during Acts II and III and intermittently in the first and last acts. This tactic was engaging but not always successful—it was difficult to appreciate the Act III quartet as whole, for example, as Marcello and Musetta were placed halfway down the aisle in the center of the audience while Mimì and Rodolfo maintained their raised position behind the orchestra and much farther away from the audience than their costars. Despite the physical and dramatic awkwardness occasioned by such moments, it was nevertheless intriguing to be immersed in Bohème as a 360-degree experience, allowing for new perspectives on the opera as a musical work and as a piece of theater. As an opera devotee, I possess a long and fond history with Bohème—the piece was my “gateway drug” into the world of opera. It was therefore particularly gratifying to attend Saturday’s show with a friend to whom Bohème (and much of the operatic repertoire) was completely unknown. By the end of the evening she was thoroughly enchanted with the music, the story, and the production, and I was reminded of my own first impressions of the opera I’ve loved for ages. In so effectively reaching a new audience, the NEMPAC Opera Project has scored an important victory for opera in the 21st century, helping to secure the genre’s survival into the future. Perhaps, then, it is not so strange that a lyric work about idealists striving to live truthfully against all odds should be presented in a hall nicknamed “The Cradle Of Liberty”; indeed, it might be just the spot for it. Kate Stringer received her MM in musicology from Boston University in 2013 and currently holds the position of Music Library Instructional and Reserves Coordinator at Boston University’s Mugar Memorial Library. In addition to her scholarly activities, she is a veteran actress, writer and director as well as a versatile mezzo-soprano who actively pursues performance interests across genres.